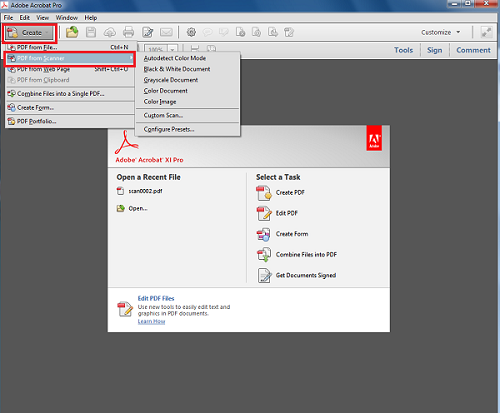 First, open the Adobe Acrobat application using the icon on the desktop. 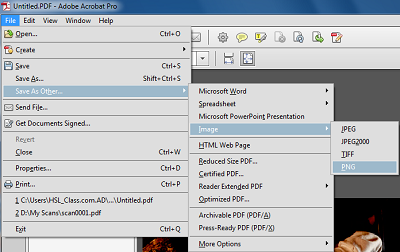 Next, in Acrobat, click on the Create button in the top left corner, then the PDF from Scanner option that drops down and finally select the type of document that you want to scan. 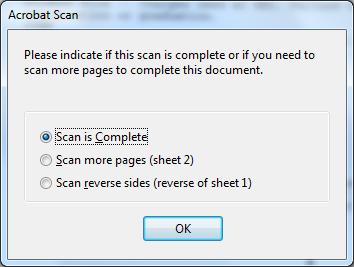 Rather than spending a ton of time scanning documents only to later find out that the scan wasn't how you desired, simply scan the first page of the document in one of the settings and make sure it looks right to you. Black & White Document scans the document in pure black and white. This scan type may be helpful if you want to make the text clearer in the scan and PDFs using Black & White will be smaller than other options. So if the size of the PDF is of concern, then Black & White would be a good choice. Greyscale Document scans the document in various shadings of black and white. This setting is generally ideal for scanning most documents, but if you're very concerned with how the PDF will look, then scan one page in Greyscale then try the Black & White option to see if that works better for you. Color Document scans the document in color. Use this option if there are figures or diagrams that contain color and you want the color to be expressed in the scan. 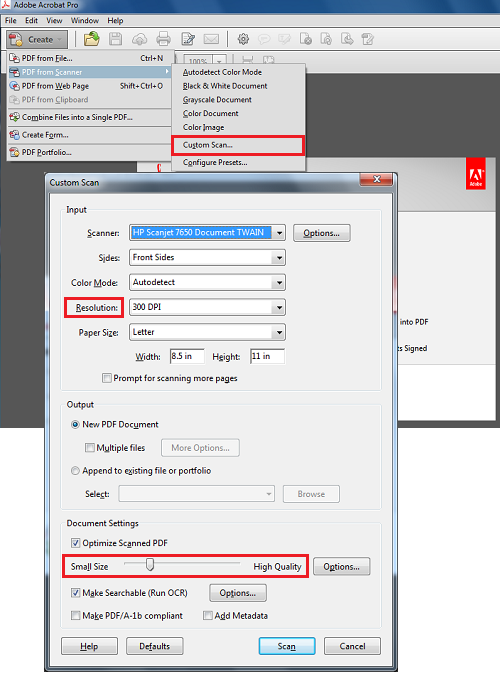 This option will create a PDF file of larger size than the previous two options. Color Image is ideal for scanning images. After you've scanned your first page, you will be prompted with a box asking if you would like to scan more pages or if the scan is complete. If you would like to scan more pages be sure to have the next page set in the scanner before you click OK. Otherwise, the scan will start and you'll have to delete that page because it wasn't correctly scanned. That is the gist of using Adobe Acrobat to scan. For more advanced options, like cropping and rotating your scan or changing the resolution of the scan, see the next section. 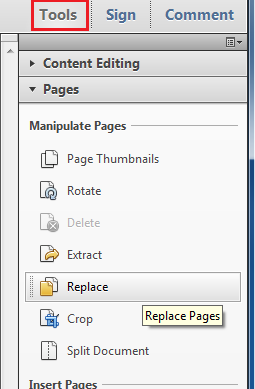 If your PDF doesn't look quite how you want it, if the pages need to be rotated, a page needs to be cropped or you need to delete a page that did not scan correctly, then select the Tools button on the right side of the screen. Under the Pages section, you'll be able to do what you need to do. Let's say that you are scanning an article from a journal from our collection and to fit the journal on to the scanner, every other page is the opposite direction, then using the rotate tool, you can rotate every other page 180 degrees so that the PDF is properly oriented. If you need your scan to be a particular DPI for whatever reason, you can use Custom Scan option while creating your PDF. A window will pop up which will allow you to change the technical details of the PDF that you create. If you have scanned an image and you'd like to save the image in an image format rather than the default PDF format, then under File then Save As Other then Image, select the desired image format. PNG and JPG are the most commonly used formats.